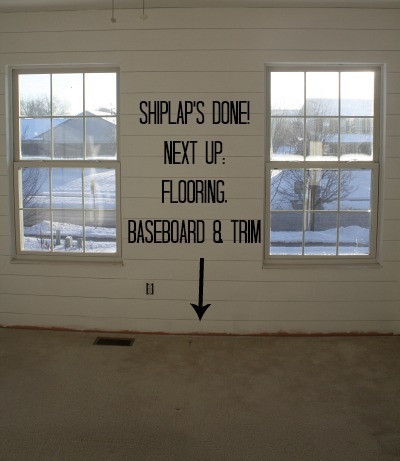 When we left off in my Family Room Makeover Saga, we had just repainted it and replaced the carpet with hardwood floors. We aren’t spending any more money on the room for a while since our wallet took such a hit from the flooring, but it’s coming together. Wanna see how it looks now? I’ve been playing with different things that I found around the house to see which colors I like with the Sherwin-Williams Sea Salt paint color. It looked pretty good with nothing but neutrals, but it’s been so cold and snowy here that I was in the mood for more color right now. I’m sure I’ll be switching things around in here a lot, but this is how it looks today. Obviously we need a rug and pillows and some artwork, etc. But if I waited to show you the room when it was totally finished, who knows how long you’d have to wait?? I ordered the black and white “Concorde Medallion” window treatments from Ballard Designs last year. The background was much more tan than I expected, but I think it warms the room up and coordinates pretty well with the tan linen ottoman in front of the sofa. I think the room could look really pretty with lots of silver and gold in here next Christmas. I pulled various pillows into the room to see which colors I like in here for Spring (because Spring has to come someday, right??). Dave’s home office got new paint and flooring, too, and this week we’ve been painting the kitchen (I posted a pic on Instagram if you want to see how that’s coming along), so we’ve been living in “makeover mess” here for weeks. Anyone else tackling any house projects right now? Do tell! Oh, Julia! It looks lovely!! So bright and cheery! What a happy room. And I love those sweet little windows on either side of the fireplace. Thanks for sharing! I love those windows, too. They weren’t in the original plans from the builder, so we paid a little extra to add them. I was inspired by old houses that often have small, square windows on either side of the fireplace. Thanks, Mandy! It looks bright, cheery and wonderful! 🙂 I like the introduction of orange for some warmth. You’re right about Christmas. I think gold would be especially nice in this room. I was looking at the leafy, sort of medallion part of your fireplace screen. That would be pretty painted out in gold, for a bit of contrast. I had a look at your kitchen too. The new paint looks fabulous with the black and white! You are really ambitious these days. I don’t know how you find the time to post interesting things for us as well as tackle all these home projects! I may have missed it, but where did you get that fabulous clock on the wall!? I love the shape!! Isn’t that fun? I got it a while ago and I’m trying to remember where. It was someplace like Home Goods, I believe, so it wasn’t too expensive! Love it! The little bits of bright color really bring the room to life. It’s looking great. Such an improvement on the “before”!! I’ve been wanting to replace our coffee table with an ottoman like that. Nice! What a warm and inviting room. It just whispers, “Come sit, talk, hang out and be together.” That wall color is beautiful in your living room and kitchen. Great job! I LOVE the tufted ottoman! Was going to ask where you got it but Laura beat me to the punch. Very nice! It’s beautiful! It’s so funny that you mentioned you still need a rug and art work because honestly I did not notice these items missing. You did a super job! The floors are beautiful. When I built our small cottage the one thing my wife was adamant on was having wood floors, easy to keep clean and better for her allergies. Showing the before and after photos of your family room one can really see the difference in light. The room is brighter, looks larger, and in turn more inviting. A really good look’n room! Oh Julia – it is darling from top to bottom! I loved it before but it seems even fresher now with the pops of color! It’s always so much fun to rearrange stuff around the house! Sometimes when I need to do some cleaning up and I feel tired and not very eager to get to it, if I can think of something to totally rearrange, I get all energized, and the cleaning up (of the much greater mess than I had to start with) becomes fun. It’s kind of crazy! 🙂 The first stage is always what I call ‘creative chaos’, but it’s worth it… when you love what you obtained in the end. I love your clock, it looks so interesting! I love the transformation! 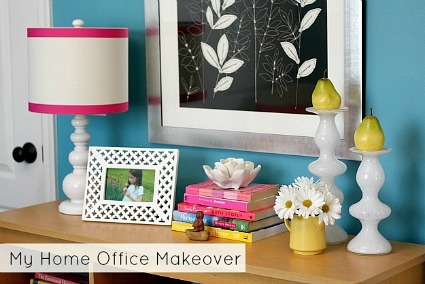 The pops of color make the room so cheerful and inviting and love that wall color even more now! You must never want to leave that room! I love the color in the room! It really does warm it up and I think silver and gold for Christmas will be divine in that room! Where did you get your bookcase? I really like that! You certainly have a knack for creating warm and inviting spaces. This room looks so welcoming. I could see it being the perfect spot to sit with a tea or a glass of wine. I love, love LOVE the wall clock! The details are soft and classic (thank you for admitting to shopping at Target). We have piano windows on either side of our fireplace as well. Thanks for sharing your space. It’s lovely. What a nice thing to say. Thanks, Jennah! Julia, isn’t it amazing what a few details (like paint and moldings around the windows and ceiling) makes? You had great foresight, and I agree with your daughter — not only does it lighten up the room considerably, but it’s a color that you can easily warm up in the winter and yet will be cool and soothing when it’s hot outside! I also love the darker hues in your wood floors; I had the oak floors in my house refinished 23 years ago before I moved in, and they’ve really taken a beating over the years w/ the pets. I dread having them refinished again (as in, *where* will I put everything?) but if/when I do, it will be in a darker color. I think you’ve shown us all how darker, more subdued hardwood flooring can easily compliment a room. I LOVE all the pops of color, particularly the orange! The blacks and neutrals play off of it beautifully. Now, I’ve got to go and hunt down the post about your kitchen, since I don’t remember seeing the updates that Alie B mentioned. Also, do you mind sharing where you bought the fireplace screen? I love it! Terrific job, and kudos to your husband, too! Hi Maggy! Always nice to hear from you. Ali is referring to the photo I posted on Instagram when we were painting the kitchen earlier this week. You can see it there (https://instagram.com/hookedonhouses). I don’t think I’ve ever done a post about that room but maybe I’ll get around to it this year. It connects to the family room, so we painted it “Sea Salt,” too. I really like it. I found that fireplace screen at TJ Maxx — another clearance item. It wasn’t level so we had to rig it a bit to get it to sit right. I don’t think anyone has ever noticed though! They told us we’ll have to move out of the house for a few days when we get the floors refinished, so I don’t know when we’ll get around to doing it. They’re looking pretty beat up, although I didn’t really notice until the new floors went in right next to them! Isn’t that always the way it is? You get something new in a room and then there are other things that look bad by comparison. Ha. Looks so warm and homey, really love the chairs! The little windows really do give the room an older look. Love them! I LOVE the blue/orange accessories!!! The room looks so bright and beautiful! I love the new paint color. I’ve been living in makeover mess for months now. Hardwoods installed in living room, dining room and staircase, then the entire first floor re-finished so they all matched the new stain color. Good news for you, we didn’t have to move out. Just 1 night of very smelly stain, and the kids slept at grandmas. We did have to give grandma the dog for the week of re-finishing. Warning – if you re-stain you will have to repaint your floor trim. Like you said, one thing leads to another! 🙂 But the end product is worth it! I didn’t even think about the floor trim! It’s always more work than you think, isn’t it? But I bet your house is looking beautiful!! I really like the faint rosy ivory of the drapes tying in so well with the rosy ivory of the fireplace tile surround, and that it’s complimentary but not matchy-matchy with the two chairs. A lovely job and I can’t wait to see how you play with it seasonally! Thanks, Mary! It will be fun to try some new things. So pretty!! I know you’ll enjoy that room for years to come!!! Love it, but what I want to know is where did you get those two fireside chairs? LOVE them! I got those from a store in town that closed years ago, sadly. It was one of those places where you choose the fabric and the frame you want, and I went for the toile. Glad you like them! They’ve held up really well. I almost bought one of those big glass vases at Target yesterday. I couldn’t figure out where I was going to use it though. Looks great with the colors on your walls. I like what you’ve done so far. The wood floors look beautiful. it was lovely before, but, it’s fabulous now! i cannot believe what a difference the shots of orange make. it totally changes the feel of the room from serious, beautifully moody, pretty to bright, gregarious (can a room be gregarious? :)), warm and a teeny bit modern. i just love it. will be stopping by for a glass of wine in a minute :)!! You have designed a lovely room! Congratulations! I collect the large glass bottles as well, but I usually end up getting mine from an auction house down the road. They don’t come up very often, but when they do, I can score them for as low as $10 because no one else bids on them. Lucky me!! $10? Wow! That’s amazing. They can get really expensive! I love colored glass. The family room looks great. I’m very curious to see what sort of rug you’ll end up choosing. I love the dental board trim at the top of your fireplace. It’s a lovely feature. I also like the fact that you don’t have your tv hanging over the fireplace. I hate that. The sea salt color is still great too. I’m going to send a card of that color to my sister, if you don’t mind. I’m in the middle of a years long process of scraping cottage cheese ceilings and stripping wallpaper that seemed beautiful in 1981. This is my mother’s house and I helped pick it out. I scraped the kitchen ceiling a couple of years ago , and removed wallpaper from 1993. The ceiling had been painted twice and my shoulders still hurt from that job. I have also done the dining, living, powder room, and wet bar ceilings. I have front hall and family room still to go. Front hall is on the agenda for end of January through February. I used to resurface and paint the ceilings but I can’t do that now since my latex allergy is more sensitive than it used to be. I have a great ceiling man now. Wish me luck. It looks really great! I just love a wood floor. I also love those armchairs you have and the drapes. I think I could see some yellow in here. Maybe a yellow pillow? Anyway, it’s really pretty. I have some yellow in the kitchen, which is open to this room, so I could totally see that. Thanks, Christina! Sherwin Williams Sea Salt is my go-to color of choice! Looks great! Looks beautiful!! I love it! Can I ask you about your roman blind? I have been wanting to replace my plantation blinds with the wood roman blinds. I have looked all over but everything I find is terribly heavy esp for my bigger windows. We actually had a custom-blinds company make that and install it for us because it’s such a big window. It’s hard to find them for that size in stores! It looks so fresh and fun! I love it! What a lovely job you did Julia! Nice colors; love the wall paint. Gorgeous windows by your FP too. Have a cozy day in your new room! So lovely and inviting. I just love these posts of your home! So Pretty!! It feels so soothing and cozy!! We just bought a home built in the early 1950s with Williamsburg blue trim and bookcases. It took 2 coats of primer and 3 coats of paint to neutralize it all with white but it was one of the most satisfying projects I have taken on! Love the way your living room turned out! Oh, wow, my hat’s off to you. Painting things like trim can really be a chore. I bet it looks like a new house with the white, though! This is too funny! We just had stranded bamboo installed in our house in November and painted the Living room “Sea Salt” too! Great minds! Did you really? Can’t wait to see how yours turned out, Cindy! It is absolutely stunning! Before you mentioned where you bought the window treatments, I was about to ask! They are so beautiful. I will have to go on Ballard’s site and window shop 🙂 Anyway, I love everything you have done. What a beautiful transformation. I, too, have been renovating. It will be a year in February. Ugh!!! We are almost done. I will keep you posted. Thanks for sharing your amazing space with us! Hi Julia thank you for inviting us into your beautiful family room. Love everything you have done so far. I really like the rugs at Pottery Barn and I also love Pier One but they don’t ship anywhere but US lucky you. Till next time Regards Esther from Sydney. PS I can see flowers on the mantle and other parts of the room come Spring time….not long to go. What a great room. I especially love the white loveseat! Where is it from? I miss that store. I bought some great furniture from them over the years. LOVELY! and very inviting too. great juxtiposition of colors, textures & prints. Enjoy! Your living room looks so pretty. Love the hardwood floors and just the right amount of color throughout! Now I know! Thank you so much!!! No way! Looks like they’re about the same width and everything, although you’ve got a door where my window is? I bet that does make it tricky to arrange the furniture. Would your sofa fit on that wall? We do have a window as well in the same spot that you do. It’s just smaller. Maybe we could fit a love seat? And put the bookshelf on the opposite wall? Okay, I see what you mean now. Hope it works for you! I love it all so much. I like the gold wall color from the before almost as much as the new green, but I immediately noticed your wonderful room now looks Bigger with the new paint color or else it is the combination of the new floor creating that more space look too. I was admiring your hardwood floors and had to laugh when I saw that it’s Bruce Hardwood in Gunstock Oak. That’s what I have! Some folks tried to tell us it was too dark but I love it. Our layout is pretty similar, too, except we don’t have the windows beside the fireplace. I wish we did, they really add something to the room. Too funny that you were admiring your own floors (sorta). Ha. I was a little worried they’d be too dark when we first moved in but they’ve been very easy to live with. I have been thinking about a BIG clock for a long time and your pics convinced me to jump. Jocelyn: World Market and Hobby Lobby both carry a similiar clock in this shape and size. You might want to check those stores if they are located near you. Thanks, Destiny! What a nice thing to say. And you’re right about the clock. I have seen similar ones at Hobby Lobby and places like that if anyone wants to look there! Looks gorgeous. I love Sherwin Williams and I painted my whole house with their HGTV Neutral Nuances palette. I used about 10 different colors throughout the house, using accent walls in almost every room. It looks great! What a lovely change! Love, love, your new room! I’ve been looking forward to seeing your finished product. You did not disappoint. The room is pulled together perfectly with the right amount of accessories. Thanks for sharing all the info on your beautiul new room. Looks GREAT!!! Question where did you get the clock on the wall, in a word COOL!! I’ve got problems, Julia, because I like the before as much as the after . I love the new floors, but I also didn’t mind the carpet and old paint color. I also like different flooring throughout a house. I think it makes it interesting and lived in. So, great job , either way !! Thanks for inviting us into your lovely home . No, they came like that, luckily! I think I get more questions about those chairs than anything else on my site! Ha. I got them years ago at a store that has since gone out of business, but all I did was choose the fabric and frames I wanted it to go on. Would be easy to replicate since toile is such a common pattern! Hi Julia: I love the new look. The “pop of color” really sets it off. Great Job! Also, as I’ve mentioned before when I’ve left a comment, you are my favorite blog. My “go to” for a pick me up. Better Homes and Gardens is having a Favorite Blogger award and they are asking people to nominate their favorite blogger. Well, you’ve got my vote. Thanks for brightening what’s turning into a long winter. Keep of the great work. P.S. This does feel like one of the longest winters ever. We woke up to tons of snow again this morning and it looks like it’s going to be crazy cold again all week. Boo. Love the new look! Wanted to ask about the curtains from Ballard..where the panels equal lengths? Im finding that lots of places I order from do not have matching lengths. Heard good things about country curtains, but my experience with Restoration Hardware, Pottery Barn and Crate and Barrel have not been good despite the high prices they charge per panel. I got the 96″ panels. Didn’t notice if they were perfectly 96″ each, though. They’re a little too long so I’m going to have to get them hemmed. May I inquire how tall your ceilings are? They’re 8-foot ceilings, which is why the window treatments were too long. Love the tip about paint – I went out and purchased “Sea Salt” for my powder room, and I love it! Depending on what colors are around it, it looks a bit like powder blue. It is a small room, though, so it’s probably a bit darker. What a beautiful, bright room to look at on this freezing winter day! The color of the walls is the perfect, not quite green, not quite gray, not quite blue color I’ve been looking for, and the floors are so gorgeous they make me want to put on some fuzzy socks and slide around. Love how the orange accents pick up their tones! I love your new family room it is really coming together. I have been scraping off my popcorn ceilings and painting every room since last April, so I know the living in limbo mode. I finished right before thanksgiving in time for family to come, but still have the trim on the stairs and some rooms to go.Hope to finish up when the weather warms and before the April one year mark. Would love to put hardwoods in my family room but I am afraid I will run into the same problem that the others will be faded. I wanted to ask where you got the great green lamp with the number on it? I love that! Thanks for sharing your home. Oh, wow, scraping the ceilings sounds like a tough job! We had those popcorn ceilings at our old house but I never got around to doing anything about them. I bet it makes a big difference in the room without them! I found that green lamp at Target a couple years ago. Glad you like it! Looks lovely! Great job. I love the paint color, for sure. Love the new wall color and the way you pulled everything together to create a gorgeous room!! Very springy too. My favorite feature in a home is a fireplace with a window on either side, so classic. I can’t find the picture (it only shows in my email I think) but I LOVE how your family too looks with the rug from your dining room – so warm and cozy :). You’re family room looks great and I can’t wait to see how it looks when you put in the new rug! Would love to know where you found that fabulous clock in your FR….Thanks so much! I think it was either Steinmart, Home Goods, or TJ Maxx. We have all three right in a row here in a strip mall and it came from a day when I bought a bunch of stuff at all three. I’ve seen clocks like that at Hobby Lobby, too, recently! Lovely window treatments, and your decor is simply splendid. Leaving the majority of your glass windows bare allows plenty of light to transmit throughout the room. I just love everything about your family room! The new flooring just warms up the whole room!! Love the color you chose, too. I can just envision a beautiful Capel braided rug in there (if it was my room of course!). I was wondering where you got the round mirror over the fireplace? I would love one for mine. I got that at the Bombay Company about 10 years ago, but it probably wouldn’t be too hard to find something similar at other stores now. Maybe somewhere like Ballard or Pottery Barn? I think the updated version is okay, but you need a rug. The hardwood floors give it a colder feel, especially with the ice blue paint. A rug would warm it back up. Also, the throws make it look cluttered. Yep, need a rug. The room’s not done yet! this is my same family room; however, I have a big marron-brownish leather sofa that I don’t know if it’s good idea to place it next to the window. Right now it’s facing the fireplace, but we can’t appreciate the pillows. Also I love the Sea Salt color you used, feels very peaceful. Hi Julia! I was just checking in to see if have any new photos of your family room? Have you found a rug, pillows, and artwork? We recently got a new sofa, armchair, and ottoman, and I’m desperately looking for some artwork myself. Well, I got a rug! That’s a start. I hung some artwork on the TV wall but I’m not happy with it, so I’m still looking for something else to put there. I’ll write an update as soon as I figure that out. Julia, would you say the wall paint is more bluish, greenish, or greyish? Yesterday I went to buy paint for my dining room, and I found them all too bluish. In German DIY stores you can get your paint mixed in the shade you like, but unfortunately they don’t offer the seasalt one you used. I don’t want the color to turn out too blue or too grey. Hi Tina! It’s mostly blue, I’d say. Although I’ve noticed that when the lights are off during the day, it looks a little more gray. hi great job i would suggest to make crown moulding pop even more come down 2 to 4 feet add some base cap moulding all around paint moulding and space in between same color as crown. also add more moulding detail above fireplace. i like your style.